A 20W class A guitar amplifier. Hand wired turret board construction all tube circuit. Aube design with point-to-point vintage circuitry. The hand-wired circuitry resonates with a warm vintage tone. 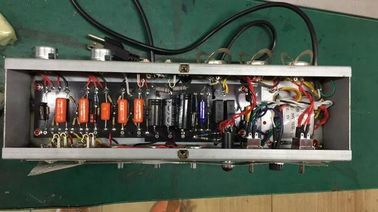 This amp uses Ruby tubes. Grand Technology Co.,Ltd is located in Shenzhen, a city full of passion and innovation. There are a number of engineers and musicians in Grand who have rich experience in the electronic acoustic industry. Grand has won 6 patents for electronic drum. Grand pursues high quality product and constant technology innovation. After several years of research and development, Grand designed and produced world-class full mesh head edrums. The products is adopted with the patent of non-contact sensor system which is fixed on bottom of drum, instead of installed next to the head of drum. This system provides high speed, equalized sound and more accurate response. Besides, with the unique mesh head construction, the elasticity of mesh head is close to real drum head and the dynamic range is large. The mesh head tightness can be adjusted according to different requests. The drum sounds are highly close to acoustic drums. Grand also developed Drum helper APP. The Drum score can be generated on a PAD when you play drum via wireless connection to module with blue tooth.